Island peak is beautiful, fairly accessible and is totally worth doing if you want to experience climbing in the Himalayas. But the mountain is far from a mere trekking peak and requires good preparation and professional guides – do not underestimate its dangers! 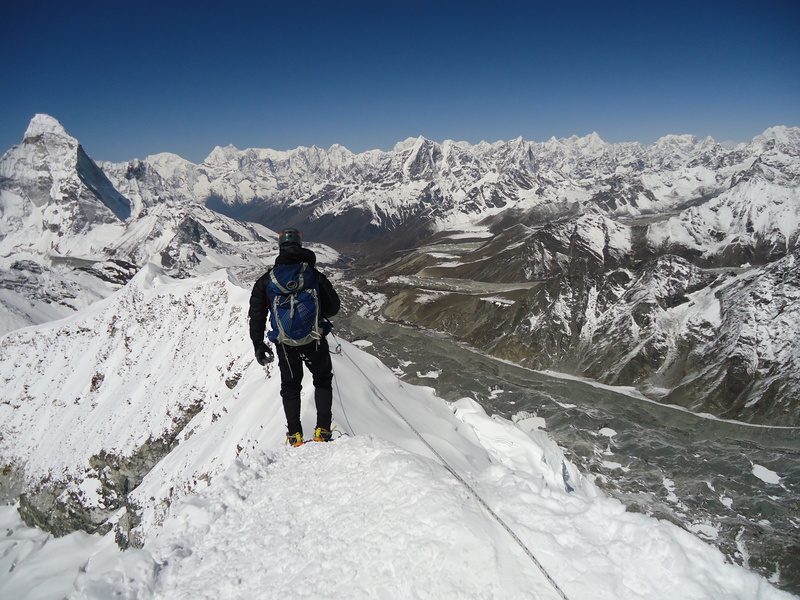 Climbing Island Peak with Ian Taylor wasn’t the hardest thing I’ve ever done, but it was certainly the most intense. We started out at around 2 am from High Camp at 5,500 meters. The first section is a scramble up a steep rocky crag. It was dark, cold and the rock was covered with snow and ice. Looking over the edge you could see nothing but pitch black and it was pretty scary going, knowing that every little slip could send you down into this blackness. Just before daybreak, at around 5 am we got to what’s called the Crampon point – an exposed section that leads up to the glacier sitting at the top of the mountain. As the name suggests, this is the place where you stop briefly and put crampons and harnesses on before continuing up the glacier. The moment you stop though your body freezes because of the cold and the icy winds! I had only worn crampons twice before and I doubt I would have been able to put them on without the help of our guides as my hands were absolutely frozen! At this point you’re already fairly tired and stressed (and I’d be even more tired if we started from Base Camp), but that’s not even half of the way. The glacier covering the top section of Island Peak is criss-crossed by some deep crevasses. The ice forms bizarre hills and caves with deep, seemingly bottomless gaps in between. The glacier is always on the move and new cracks may open at any time, even under your feet! We had to cross one of the crevasses over a steel ladder. It’s only three steps across, but looking down you couldn’t even see the bottom, so those 3 steps were pretty intense! Directly above the crevasse was a nearly vertical ice wall, about 10 meters high. I was jumaring up the wall (going up a fixed rope with the aid of a mountaineering device called the ascender or jumar) when one of my crampons slipped and came dangling off my foot. I remember nearly panicking at this stage, but luckily our guide Ian Taylor was directly behind me. He told me to stay put and he managed to attach the crampon back to my boot. After crossing the glacier, with all its crevasses, ice hills and exposed ridges, we were facing the Head wall – a huge mass of rock and ice about 150 meters high that we had to climb to reach the summit. The sun was completely out at this stage and at least it wasn’t very cold. The wall starts at about a 45 degree angle and then straightens up to 60 degrees, but at times it felt like it was totally vertical. There are fixed ropes leading up to the top and a big queue of climbers (a total of about 30 people were climbing with us on the day) was lining up to use them. Some had already started to go down – just as others were climbing up the wall… The sheer number of climbers going in both directions makes the use of fixed ropes highly dangerous. There have also been incidents of anchors coming off, people falling and getting injured. That is why if you climb Island Peak make sure your guide has their own ropes and do not rely on the fixed ropes that have been on the mountain for months and – who knows – maybe years! Jumaring up the head wall is hard work even for experienced mountaineers and is very tough on the legs – especially after the strenuous climb over the rock and glacier earlier on. I think it took us about an hour to finish this section. Some of our team members barely made it and were saying afterwards that the Head wall was the hardest thing they’d ever done. I remember being absolutely exhausted upon reaching the top, however a few years before I had to push myself harder: when I ran – and finished – my first marathon without adequate preparation. After scaling the Head wall there is only one thing left to do – cross a narrow ridge with sheer drops of at 1000-2000 meters on either side. And then you’re at the summit. The summit of Island Peak is very small – not much wider than the top of a dinner table. 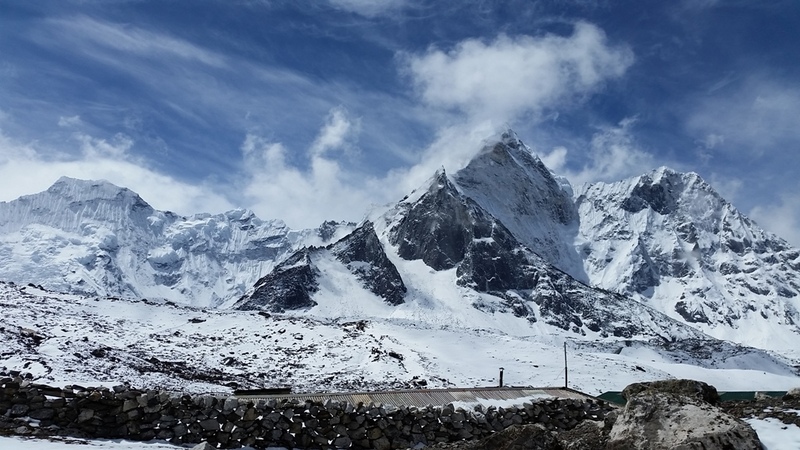 It’s exhilarating to stand there and admire the bird’s eye views of the surroundings: the smaller mountains around, the glaciers, the huge Nuptse wall hiding the Everest summit behind it and the frozen Imja lake down below. You really feel what it must be like standing on top of Everest, K2 and the other top peaks – and appreciate just how tough and dangerous reaching those heights must be. 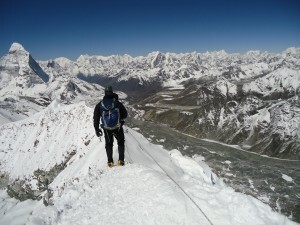 CLICK HERE and read another blog post on climbing Island peak with us. 1). 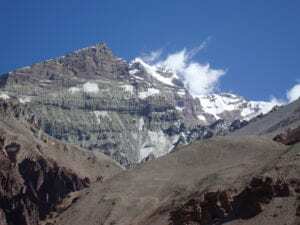 Island Peak is not a “trekking peak”. Climbing it is a real challenge (plenty of experienced mountaineers would agree) and should not be underestimated. 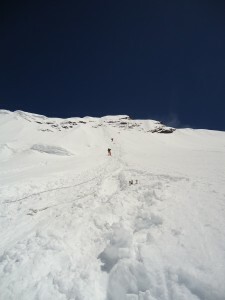 Prepare well for the trip and do as much winter training as you can, including crampons, abseiling, ropes, glaciers etc. 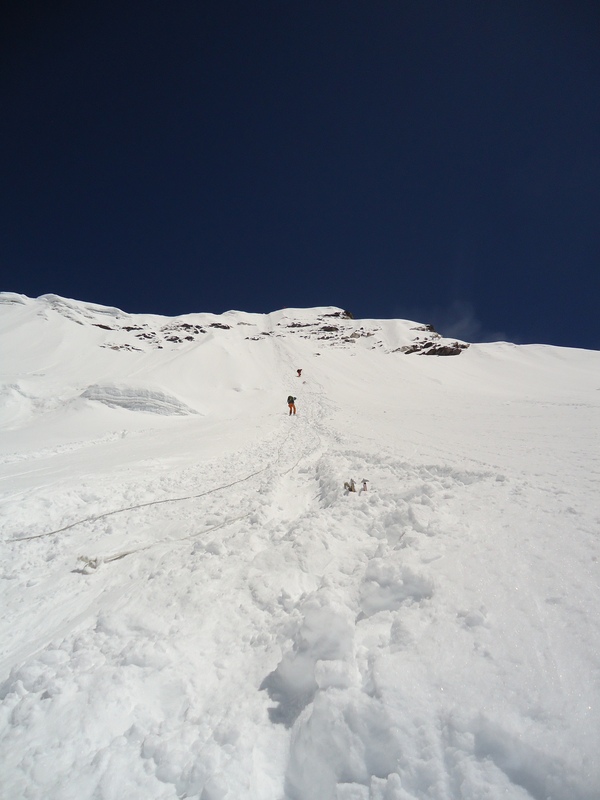 These things can be pretty daunting if you do them for the first time in freezing temperatures at 6000 meters! Every mistake here can lead to injury or worse. 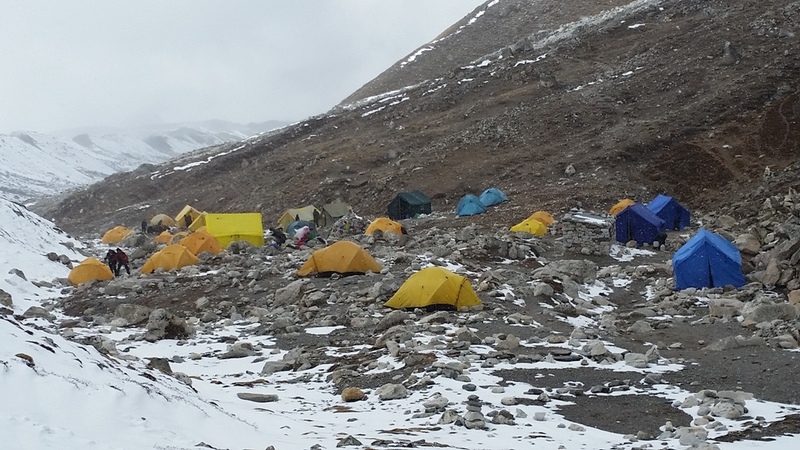 Our guide Ian Taylor trained us at Base Camp before summit day, and this helped tremendously. I also did a 2-day winter skills training in Scotland a couple of months before the trip. And still, I wish I had more preparation. 2). Buy your own mountaineering boots and get used to them/break them in well before the trip. I hired mine in Chukhung (a village one day’s walk away from Island Peak Base Camp) and the boots turned out to be terrible! My feet were absolutely frozen during the climb and I was really worried I’d lose my toes to frostbite, which only upped my anxiety. In the end I didn’t lose my toes, but I got some nasty blisters, lost a toenail and lost feeling in three of the toes (after just a day of climbing in those rented boots). It took more than a month for my feet to recover. I had been told to buy my own mountaineering boots and which I had of taken that advice. 3). Find good, reliable guides. I can totally recommend Ian Taylor and the Sherpas who work with him, especially the legend that is Ang Kami who’s been on top of Island Peak about 150 times, summited Everest and Ama Dablam, among many other mountains. 4). Bring plenty of water. Guides normally tell you to bring as little weight as possible, and I had only one Nalgene bottle with me. But if I was doing Island Peak again I think I would bring 2 or 3.